Although the wedding day has come and gone, the wedding posts don’t stop! Brian and I just celebrated our 4-month anniversary—officially surpassing some extremely short celebrity marriages—and we still haven’t finished all the left over liquor, wine, and beer from the wedding. What we planned: We used a combination of websites including TheKnot, A Practical Wedding, and Party Source as well as tips from previous brides and grooms to calculate how much we needed. We unfortunately did not have assistance from our caterer with this although many couples we spoke to did. 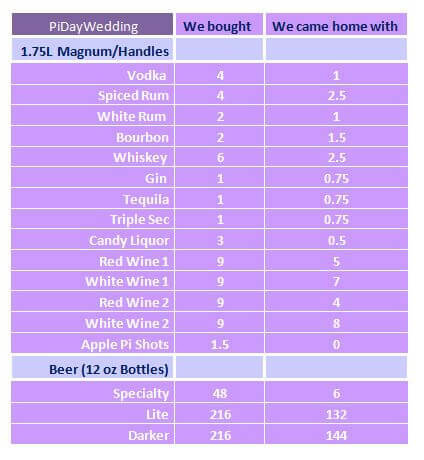 When we started sending out invitations for the wedding, our guest list was pushing 160 so we felt safer planning our liquor for 150 people since some estimates seemed extremely low (Party Source’s liquor would have been waaaaay off for us). We did remember to factor in children, elderly, and those who did not drink. We kept our timeline to the 5 hour time span at the venue for planning (if you’re hosting an after party at the hotel, you may want to include that extra time). 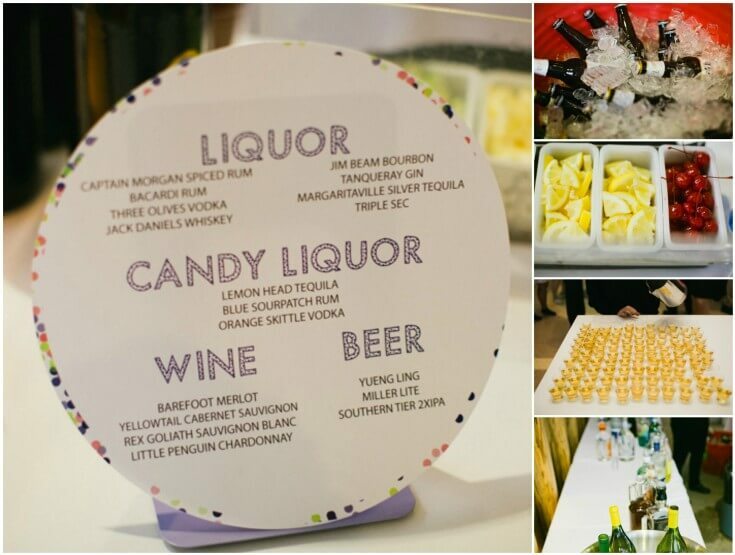 This entry was posted in Wedding on a Budget and tagged alcohol, byob, planning, wedding on July 29, 2015 by Katie Jakub. It sounds extremely nice, also for your wallet:P!!! Haha, our wallet took the hit at the beginning so now we’re just kind of reaping our overbuying (mis)fortune. Well at least now you have a well-stocked bar for parties! I know, Katie’s set right? Absolutely! And we’ve always got a bottle to take to other parties as well. White wine for everyone! Wow! That’s a lot of booze you have stocked up now. Have you had your big home party? 282 beer bottles will go a long way! We did a party in April and shockingly ended up with more liquor because people brought stuff (even though we were strongly encouraging them not to). We’ve been giving beer away to family and friends and our beer league softball team has enjoyed the surplus! I think we have 1 case left finally! Yeah, you guys have come up on a good stockpile for your bar. Well done! Agreed, they are set for a while! Brian built an awesome bar in our kitchen and for the longest time it looked so incredibly bare. Now, it looks like we’re definitely alcohol enthusiasts! Great guidance for buying liquor, containing costs and having fun. A nice trifecta! Absolutely–it’s the gift that keeps on giving too! Okay, this was a totally cool post, but I’m confused. Who was it that got married? Please excuse my dumbness! I think I asked this question months ago, and the answer wasn’t Femme herself, right? She’s already a Missus? I should have put a blurb….apologies! This is Katie again. She has a bio if you want to get to know her: https://femmefrugality.com/sample-page/katie-jakub Plus she’s not as camera shy as I am! And yes, I’m already wed. A bit over a year now! Haha. I have to use all the wedding photos somehow now! And thanks! 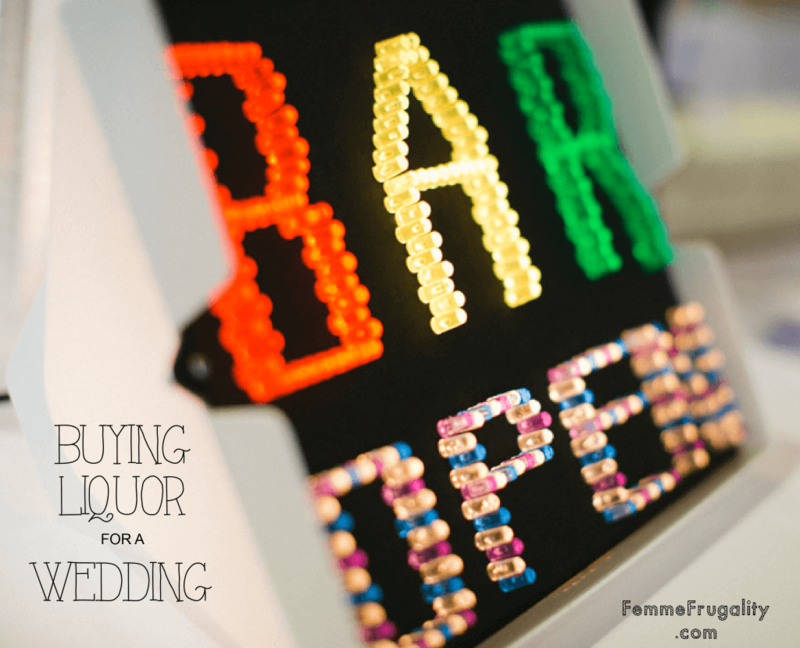 I was really cranky when all I could find about planning a wedding BYOB was what people bought, not what they should have bought (i.e. the end results). Sounds like you had a well planned, good time at your wedding. I personally brewed 20 gallons of 4 different types of beers and made 6 gallons of Riesling wine for my wedding. Unfortunately my wedding got canceled. Sorry to hear about the cancellation! The Riesling sounds like it would be delicious though. We weren’t quite adventurous enough to try from scratch brews…we stuck to adding candy to liquor. I always overbuy when planning parties, too! Usually in the way of food, though, which wouldn’t last us so long after the event. 😉 I’m surprised the wine didn’t go more quickly!